The National 9/11 Memorial at the site of the World Trade Center in New York encompasses the footprints of the two towers turned into cascading waterfalls and surrounded by bronze parapets featuring the names of the 2,983 people who died during the attacks on September 11, 2001 and on February 26, 1993. The memorial also includes a visitors' center (which is not yet complete), memorial cobblestones and pavers (which you can sponsor) and many trees, including the Survivor Tree (a pear tree that was pulled out of the rubble after 9/11). Scott and I postponed our visit to the Memorial several times until we were in the right mindset and had the right weather conditions. To me it is the combination of the blue sky and tall buildings reflecting in the calmer water at the top of the waterfalls with the water crashing down and being pulled into the deep dark square in the middle of each footprint that makes this memorial so effective and appropriate. 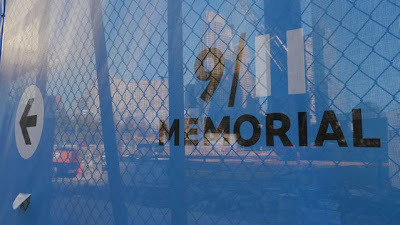 The blue sky of September 11, the planes, the tall buildings, the crashing, the height, the deep abyss, the pull down. To see all the names, each an individual is almost too much to take - but again, absolutely fitting. You have to make reservations ahead of time and security at the site is very intense (including airport-like x-rays). We wondered if this is how the memorial would always be or if one day people can just walk in from the street. It's a sad irony that a memorial to the victims of a terrorist attack would have to be so heavily guarded because of the terror we are still experiencing and anticipating. As much as I hate this phrase, I couldn't help thinking: But doesn't that mean the terrorists won? As my camera looked up from the bottom of the waterfall to the rising new towers still under construction and a plane flying by in the blue sky, I had to tell myself: no, they didn't win. We all lost a lot. But they didn't win. Nobody won. In the next few days I plan to also upload a longer version of this video and share more photos.